Well it’s that time of year when I feel like a kid in a candy store. No silly, Christmas is over, it’s seed catalogue time. It’s that time of year when seed catalogues from all over the country fill your mailbox to overflowing. See? What to buy? What to plant? I see these gorgeous catalogues and I want them all. ( As if I planted them they would all turn into fruits and vegetables). Hey, some do and some don’t. However, at this time I have great expectations. Last year was the first year I planted seeds in my garden and not transplants. I decided I needed a light source for my seedlings and bought this light. The light source is movable and can be lowered or raised depending on your seedlings. This is important because if your light source is too far away from your seedlings, they will be tall and “leggy”. Why don’t you ask me how I know this? This year I am going to add a heat mat to aid in germination. I also need to order some more peat pots to fill the system that I purchased. If I were buying a new one I would get larger pots, but since I have the small ones I will just stick with it. They did just fine last year. It may require transplanting an extra step as they get bigger and bigger. I purchased these items at www.parkseeds.com. The most important piece of information you will need to know once you have picked out your seeds is the last frost date for your area. I just googled frost dates for zone 8b and found that mine is March 17th. Depending on the type of seed you are planting, you will count back from your frost date for your seed planting date. For example, let’s say your last frost date is March 20th and you want to start tomato plants indoors. You would need to start your seeds 8 weeks before the last frost date which would be approximately Jan. 23rd. There is a great gardening guide at Baker Creek Heirloom Seeds which I found very helpful. You can find it at www.rareseeds.com/guide. It was my gardening bible last year. Some seeds can be directly sown into the garden like peas, carrots, lettuce, squash and cucumbers to name a few. Directly sown seeds are my personal favorite because I seem to have better luck with them. Although last year my cherry tomato plants I grew from seed did very well. But for right now, I am just enjoying trying to figure out what to buy. Last year I bought English peas because I haven’t been able to find fresh ones at our farmers market (peas are delicate and don’t travel well). I also bought a variety of tomato seeds ( way too many – this year will stick with 2 or 3) as well as zucchini, yellow squash, lettuce, herbs, purple hull peas and lemon cucumbers. But just like a kid in the candy store, I am limited by that nickel in my pocket so I do have to use some restraint. I am going to pick items that we eat on a regular basis and those that will fit into my pint-sized garden. Well, considering all that has happened with the economy, I am really glad that I have planted a small tiny garden. Even if there will be no exporting or selling for big bucks. Hopefully, I will have enough for a salad or two. I have planted a butterhead lettuce, Lactuca sativa, specifically – Tom Thumb. As you may have guessed, the heads are small. About the size of a baseball with leaves. 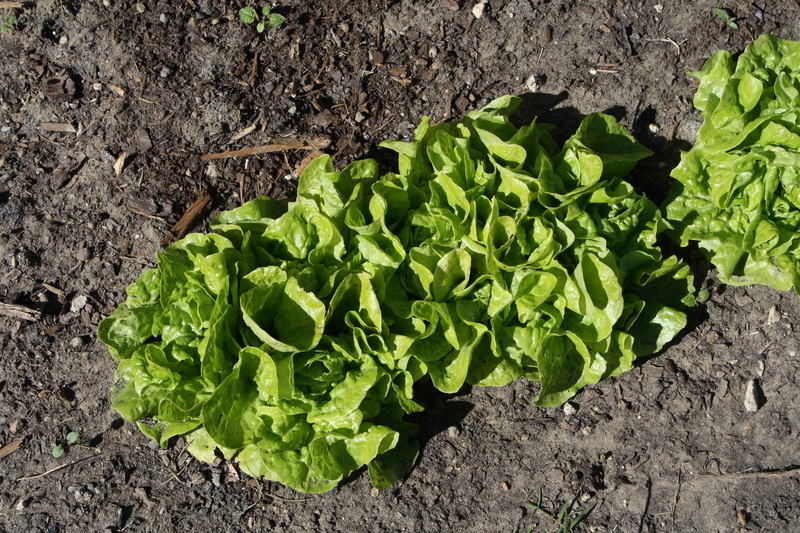 It is the perfect lettuce for space challenged gardens. I got my seeds at www.heirloomseeds.com. I have also planted flat leaf parsley, bright lights swiss chard, and Monstrueuse de Viroley spinach. I planted flat leaf parsley because I like to use it in cooking over the curled leaf variety. I planted the bright lights swiss chard because of the different colored stems, red, yellow and orange as opposed to just plain old chard. The spinach variety was planted because I loved the description at www.rareseeds.com “A gourmet French heirloom developed prior to 1866”. I figure if it’s been around that long maybe even I can’t kill it. It is also described as “very fast growing, popular for fall planting”. Bingo. This spinach is supposed to have large leaves and are of the smooth variety. I have never planted spinach, so this will be a new experience. 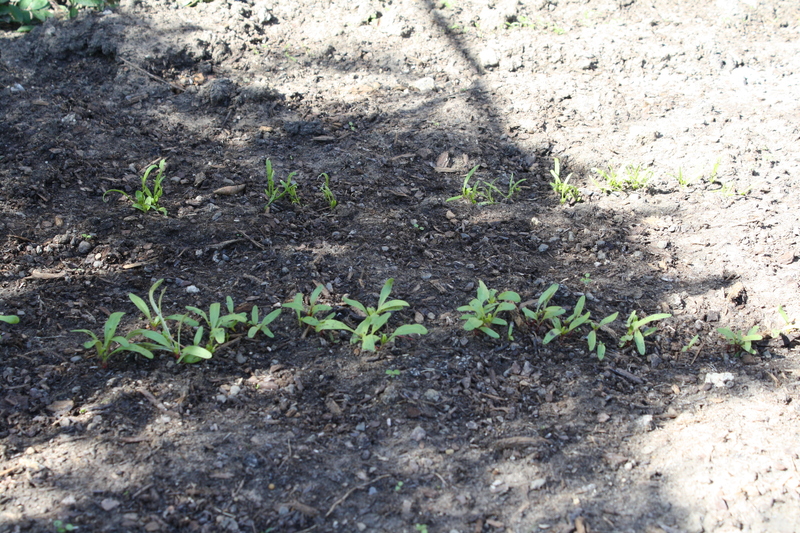 I have planted swiss chard before but only with transplants, not from seed. Parsley I have had a “hit and miss” success, so we shall see. Here are the early beginnings.